Pam Fraser is a newly certified insurance agent at Kennedy Insurance, and her journey here has been a remarkable one. Pam got into the insurance business to help people navigate the system that she came to be very familiar with after a terrible accident when she rolled her car near Sturgeon Falls. 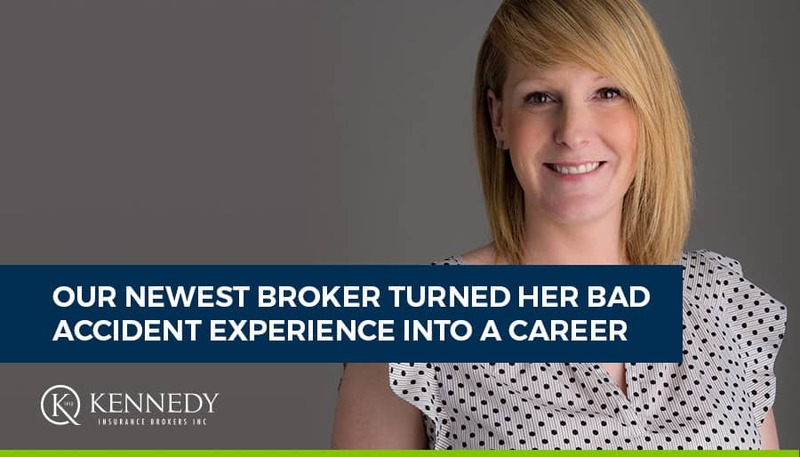 It was a day that changed her life and eventually led her to choosing a career in the insurance business. Almost 10 years ago, Pam was a single mom and a personal support worker in her early twenties living in Sturgeon Falls. Born and raised in Sturgeon, she had moved to Montreal with her family when she was younger and moved back to Sturgeon to raise her child just a couple of years before her accident. Her job as an in-house personal support worker saw her driving between clients every day, and it was on one of those trips between clients’ homes that her vehicle blew a tire and flipped 10 times. She doesn’t remember anything about the accident, but she had numerous injuries from the accident that left her unable to return to work, even after an extended period of time. It was at this point that Pam’s journey of navigating insurance claims began. Being a single mom on a smaller salary, any insurance outside of her mandatory coverage on her auto insurance wasn’t something that she had thought to purchase. In addition, any payouts from the insurance company under an auto policy can be held up if an accident happens at work, which meant that Pam had to wait for her case to slowly make its way through WSIB before her insurance company would even look at it. This practice isn’t a nefarious one on the part of the insurance company – it is simply how the system works. In the meantime, her bills piled up and she had to declare personal bankruptcy. She couldn’t even go on Ontario Works because she had too many assets. In Pam’s view, this all would not have had to happen if she had additional insurance coverages, and she set out to train for a career in insurance specifically to keep other people from going through the same thing she did by educating clients on accidental and sickness benefits. “I don’t want anyone else to live what I lived,” says Pam. Critical illness insurance was invented by a group of doctors in South Africa that developed life saving techniques for heart attacks. The people they were saving were healthy, but often in financial ruin by the time their recovery was over. Wanting to see their patients financially healthy as well as physically healthy, the doctors created a new form of insurance in 1983. Since then, critical illness has grown into a “must-have” product offered by insurance companies all over the world. The problem is getting clients to view it as a must-have, until they need it. The cheapest time to get it and maintain it is in your early life when you have less chance of developing a critical illness or disability, and premiums can stay the same as you age. Supports such as employment insurance only go so far if you have a long-term recovery from a critical illness such as a heart attack or cancer, and they usually don’t go far enough. Plus, being financially secure can help you focus on what you need to: getting better. Accident-Only disability insurance is a different product and is usually cheaper than critical illness and easier to get because it doesn’t require a medical exam and only pays out in the event of an accident, which is statistically less likely over the course of your lifetime than a critical illness. It is better to refer to these types of coverages as paycheque replacement insurance, because that is essentially what they do, in addition to covering costs associated with your recovery in many cases. Pam is now happy, healthy, and living in Powassan with her four children. Her journey saw her eventually break even, as she navigated the claims and court system and achieved a good settlement. Her mission now is to help people avoid the process she had to go through. Pam cautions that everything isn’t handled that you think you may have handled. “Young people think they have everything covered – they don’t. Auto insurance doesn’t cover it, group insurance doesn’t cover it, what happens to your life if you wake up tomorrow morning and something happens?” Pam is also mindful of navigating the claims process and is the best and most empathetic person you could have in your corner if you ever did have to make a claim – although she’ll get you the right coverage from the start. Kennedy is proud to welcome Pam to the team and is very excited about how she can help people in North Bay and surrounding areas ensure that they are covered if things go wrong. Pam’s French is also very strong, so she looks forward to educating clients in both official languages. Kennedy Insurance is also the only brokerage in the area to have Life, Auto, Accident, Disability, Critical Illness coverages, Commercial insurance and group benefit plans available under one roof, so you’ll never be paying for more insurance than you actually need. Contact Pam today at pamela@kennedyinsurance.ca for a consultation – she’ll let you know exactly what you need to protect your paycheque if something happens to you.